There are few certainties in the post-Black Friday online poker world. One fact that we are all still sure of is that nothing has changed with respect to the fact that playing online poker is legal on the federal level in the U.S. If an American player finds a poker site willing to take his business, and if he can manage to get his money to and from that site, he is not violating any federal law by doing so. So while the remaining U.S.-facing online poker sites are unlikely to be anywhere near as large, reputable, or financially liquid as what players are used to, as long as the risk of losing one's funds is small enough, there may still be some (severely-reduced) profit opportunities for American poker players, or, at the very least, a means of continuing to stay competitive at poker by practicing one's skills at one's leisure. Since the subset of former American players which chooses to move to these sites will be highly skewed towards serious, professional players, all players should expect their winrates to drop significantly. Deposits and withdrawals will be more costly and more unstable, and players should account for some nonzero probability of never receiving a cashout. In the event of either voluntary or government-induced site closure, due to liquidity issues and the fact that these sites are less reputable, there is some probability that U.S. players would never get their account balances returned to them. Not too comforting. To be sure, even if playing on the remaining smaller sites is otherwise acceptable and a reasonable substitute for the experience of pre-Black Friday online poker (which will not be the case for all poker players), these issues are serious and will annihilate a lot of utility. These added risks cause players to have to make tradeoffs involving their profit potential and the amount of money they risk in their account balances at these sites. Putting it all together, how big are these costs? How bad do these risks have to be before it's not worth even trying to continue to play online? We can quantify this with a model which can estimate the effects of these risks on expected utility through Monte Carlo simulation. We start by making assumptions about various aspects of the risks and costs of playing on these sites. Some of these are deterministic, and others will be uncertain. Once we have settled upon reasonable estimates of these values for all of these parameters, we can vary the most critical parameters to find break-even thresholds for expected utility, which can guide player decisions. Fees associated with deposits and withdrawals — Deposits and withdrawals at smaller sites are costly, in both inconvenience and fees, so managing account balances carefully will be important to avoid incurring too many of these expenses. Our model will consider fixed fees for depositing or withdrawing, which we can expand to include intangible costs that reflect the inconveniences of these money transfers. Deposit/withdrawal strategies — The simplest way to describe a rule that guides when to cash out or deposit is a set of four numbers. When the player's account balance is below some critical level (such as when it is too low to play his chosen stakes and number of tables), he should redeposit to bring his account balance up to some higher threshold level. Similarly, since he doesn't want to keep an unnecessary amount of money in a risky account, when his account balance hits some upper critical level, he should withdraw to bring his account balance down to some lower threshold level (which might be close to, if not exactly the same as, the threshold level for deposits). Winrate, standard deviation, and play volume — The model will approximate poker results by increments of the appropriate normal distribution. To match the rest of the model, rather than looking at winrate and standard deviation per hand, we can look at these on a per-day basis by factoring in the amount of hands the player plans to play each day. The number of days remaining in the year will be one of the inputs. Per-day probability of site closure — In our model, at the end of each day, we will assume that there is a fixed probability that the site will close forever. Each day will be independent of the last. 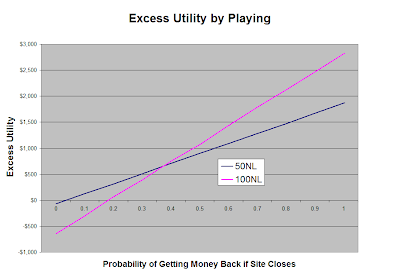 Probability of getting paid if the site closes — When the site closes, there is a chance that all player balances will be lost. 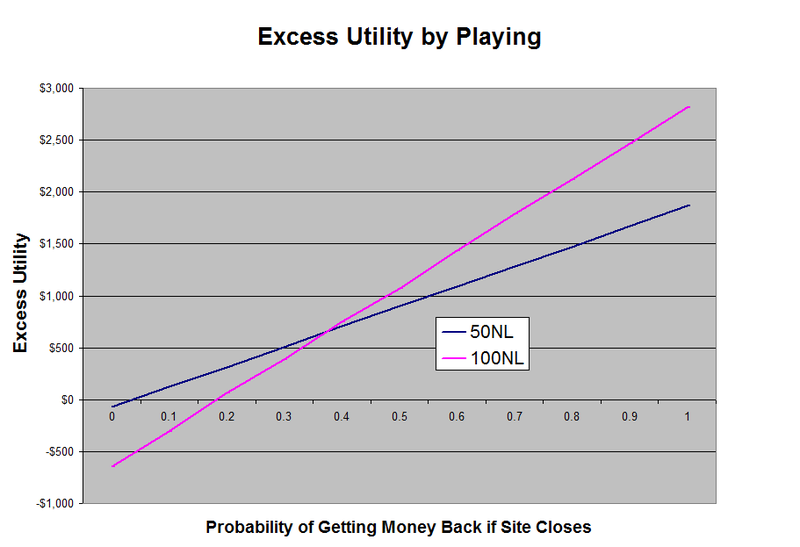 Probability of getting paid on each cashout — For each cashout prior to closure, there is a chance that the player will never see his money (or never be able to cash out in the first place). We can assume that this probability is less than that of the probability of getting paid when the site closes. That's a lot of inputs, and a lot of inputs that we can't necessarily get great estimates of. Since the non-standard parts of this model are those pertaining to the risks of having money with the online site, we can ignore the lesser (or at least more standard) uncertainty on personal game performance parameters and instead assume that we know the player's exact winrate. We'll again work with our typical poker player: $80k net worth, $40k non-poker income, $10k year-to-date poker winnings, and isoelsatic utility with ρ=0.8, paying both federal and NJ income taxes. For simplicity, we'll assume that any money lost due to site-specific risks is treated the same as a poker loss and directly deductible against poker winnings, though I believe this is not exactly true. UPDATE 06/18/2011: The above assumption may only be valid for those who file their taxes as professional poker players. Amateur poker players likely cannot deduct these losses at all in most cases, and this has serious implications for the model. See Update/correction to risky site model: Casualty losses and tax effects. I'm not entirely familiar with costs of deposit and withdrawal at all of the remaining U.S.-facing poker sites, but for Carbon Poker, it looks like roughly $17 in costs to make a deposit, and about $5 per withdrawal for a medium-volume player. We'll look at two possible levels of stakes for our player: multitabling $0.25/$0.50 NL at an hourly winrate of $10 with a standard deviation of about $70, or multitabling $0.50/$1.00 NL with an hourly winrate of $15 and a standard deviation of about $140. His $0.50/$1 winrate is higher in dollars, but lower relative to the stakes, which introduces not only the usual higher relative risk to his results, but also a need to keep a higher balance with the site. Keep in mind that he will have a much tougher time achieving these winrates on a remaining U.S.-facing website, since the player pools will be significantly tougher and it may not always be possible to play as many tables as he would normally be accustomed to. In the post-Black Friday market, I would expect winrates to be significantly lower than the good old days, and most players should probably drop down at least a level or two. We assume that, for $0.25/$0.50 NL, he will redeposit when his balance falls below $800, and he will redeposit up to $1,200. He will withdraw down to $1,200 when his balance hits $2,000. For $0.50/$1 NL, we will double each of these deposit/withdrawal thresholds. Once we settle upon the other parameters, we can play with this to see which withdrawal strategy is optimal. As a default, based on no science at all and simply my gut assessment of the risks of the current poker market, we'll assume that the per-day probability of site closure is 0.002 (i.e. the site lasts, on average, 500 days), that there is a 50% probability of players getting paid if the site closes, and a 75% probability of getting paid on any given cashout prior to closure. We'll have him start playing in early May, so there's about N=240 days left in the year. Initialize the player's starting bankroll by him making his first deposit, tracking the costs of doing so in a running net total starting from his year-to-date winnings. This running net will NOT include his day-to-day poker results; money on the site is not counted as a gain or loss until it is successfully withdrawn. At the start of each day, the player plays his daily poker session, and we adjust his site balance by a normal random variable with appropriate mean and variance. Since he can't lose more than he has on the site, we truncate this normal distribution on both tails by preventing the magnitude of the swing from exceeding his existing balance. After his session, if his bankroll is below his deposit threshold, he deposits according to his strategy. We track both the deposit itself and the costs of doing so in the running net. Then, if his bankroll is above his withdrawal threshold, he withdraws according to his strategy. He ends up receiving the cashout according to the chosen probability, which will be added to the running net, less the costs. If he gets unlucky and misses on the cashout, we assume it is lost forever. At the end of each day, the site closes down according to the chosen per-day probability. If the site shuts down, the player's balance is returned to him according to the probability of getting paid if the site closes. Either way, if the site closes, we exit the loop and go directly to step 7, as there's no longer any poker to be played (we neglect the possibility of choosing another remaining site for the rest of the year). Repeat steps 2-5 for each of the remaining N days. At the end of the year, if the site is still open, for the purposes of evaluating his year-end utility, the player withdraws his balance (and receives it according to the chosen probability). This gives his final net winnings for the year, and we evaluate the after-tax utility of this amount. Repeat steps 1-7 in a Monte Carlo simulation to simulate the average expected utility. For the parameters we chose, we can look at how the results change as we perturb the most uncertain parameters, those related to site-specific risks. First, if we disregard the assumption of getting paid 50% of the time if the site closes, and instead vary that, we can see what the effects of additional liquidity are and find the break-even liquidity level. Since this liquidity and the probability of successful cashouts are linked, it is desirable to adjust both at the same time, so as we vary the liquidity level, we will assume that the risk of losing a cashout is always half the risk of losing a bankroll in the event of closure. The rightmost point is when the site is fully secure, which is what decision-makers have been roughly used to in the pre-Black Friday environment. In this case, the player prefers to play his more pure-EV-profitable stake of 100NL. As the site gets less and less secure, the need to keep a higher bankroll at the site for 100NL will create more and more risk, and 50NL becomes better when the site liquidity falls below about 38%. For less than 5% liquidity, the increase in the player's utility by playing either stake is negative, so the player should refrain from playing at all, unless the entertainment value or the value of being able to practice and work on his game is worth the cost. If we return the liquidity probability to its original default rate of 50%, we can instead look at how expected utility varies with the per-day probability of site closure. When changing the average lifetime of the poker site, we see that the effect is less linear. Again, the rightmost point corresponds to perfect safety, a site that has no risk of closing. As the probability of closing is increased (and we assume a 50% chance of not being able to get money back after closure), the expected utility drops off significantly. 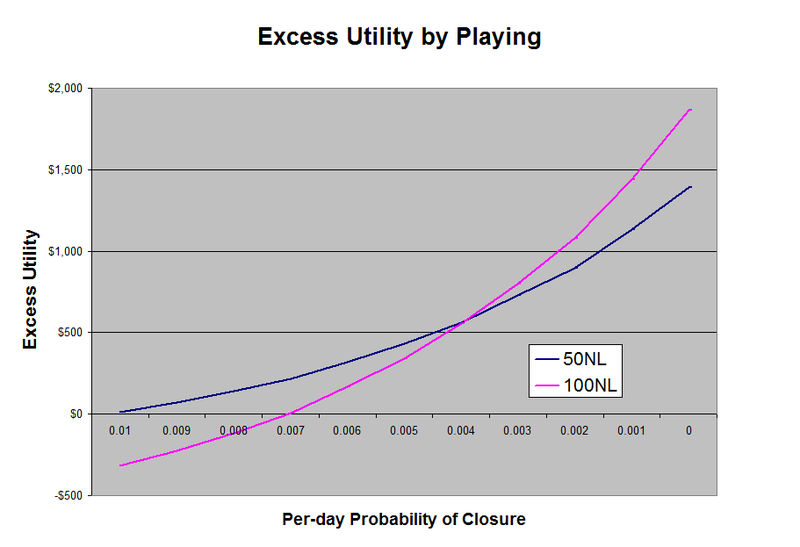 50NL overtakes 100NL around a per-day closure probability of 0.004 (i.e. a mean lifetime of 250 days). 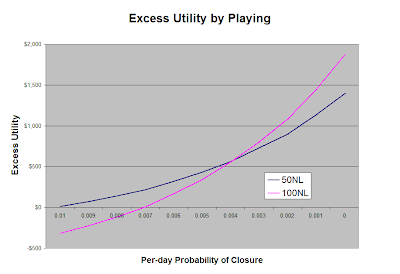 Not playing at all becomes the best choice at a per-day closure probability of around 0.01 (i.e. a mean lifetime of 100 days). If we return to the original, fixed best estimates of these parameters (50% liquidity, average site lifetime of 500 days), we can tweak the deposit and withdrawal strategies to see which one works best. We'll stick with just 50NL here, since it seems to be the better choice. We need to keep the lower deposit threshold at $800 in order for the player to have enough bankroll to be able to play a bunch of tables of 50NL during his sessions, but we can vary the other three account balance strategy parameters. We see that we can actually do better than the deposit and withdrawal strategy that we initially chose. It turns out to be better to wait to withdraw until at a higher balance, but still to deposit up to just $1,200. I suppose that this asymmetry comes about due to our utility function; we have a higher relative risk tolerance when we have earned more money on the year. We see that the "tightest" deposit and withdrawal thresholds do not do well here. This is all due to the interplay between the site-specific risks and the costs of moving money, and this behavior will probably change when any of these are modified. If we compare the middle parts of each of the graphs to the rightmost points (which correspond to perfect safety), we can really see how much our utility suffers under these new risks. Players will need to have significant edges over their competition to overcome this. In these results, the "shape" of the results is no surprise. We're not seeing anything we wouldn't have been able to guess without doing the math, but quantifying it provides a useful framework for guiding our play decisions under the uncertainty of the site-specific risks. For our example player here, we see that, under the default assumptions with 50% liquidity and an average site lifetime of 500 days, playing 100NL will be a better risk-adjusted value than 50NL, though it's close enough that the player should move down if he feels the liquidity risk is greater, or that the sites have a significantly shorter expected lifetime. To dissuade him from playing entirely, there would have to be either a very low probability of getting paid back if the site closed, or withdrawals while the site is still operating would have to be less than 50% likely to go through. So, for this winning player, it looks like playing on a remaining U.S.-facing website should be better than quitting entirely as long as he has at least some faith in the current market. Many less skilled players with thinner winrates will be forced out of the market entirely from these additional risks. This model is well-suited to being dynamically updated as the year goes on. The time horizon and year-to-date winnings will change constantly, which will shape bankroll decisions. Also, it should be useful to update the site-specific risks with better estimates as time goes on and as more information develops in the wake of Black Friday, or as the market positioning of the remaining U.S.-facing sites change. While it's easy to see results by varying the site-specific parameters in this model when the player-specific variables (utility, income, winrate, etc.) are fixed, it's hard to draw broader conclusions over a more general player base. This is the sort of model that is best applied on a case-by-case basis, with each user's particular play variables fixed and known. If enough people are interested in using the spreadsheet I wrote for this, I might consider cleaning it up and hosting it somewhere. If playing on a risky site is only profitable for a certain portion of the current winning players (say the top 80% of winning players), and most of the lower 20% choose to act rationally and not play on the risky site, won't this result in a feedback loop where the competition on the risky site becomes tougher (i.e., less profitable), cutting out the bottom players from the originally profitable group and in turn making the site unprofitable for yet another slice of the remaining winning players? Yeah, I agree that, for practical purposes, this effect is going to be a much bigger problem post-Black Friday, because many of the migrating players will be those who were formerly profitable and who will not continue to play if they find that they are no longer profitable. Just another reason to move down several levels -- ideally, one level more than one's peers. But it is worth noting that this effect should exist in any poker environment, even pre-Black Friday online poker, and yet plenty of losing players end up not quitting poker. Not rational in the profit-maximizing sense, but rational if they enjoy paying for the entertainment that competing at poker provides. Since the utility reduction from the site-specific risks has the net effect of simply dragging down effective winrates, there's no particular difference between the "new losers" and the old losers on the safe sites. Granted, post-Black Friday U.S. sites are going to have a much smaller percentage of recreational players, who should make up the majority of the persistent losers, and a much lesser intake of brand new players into the environment, but neither of these should be zero (I hope). I've had a few ideas relating to models for this sort of feedback effect and might explore them sometime soon. I definitely agree that there is a certain segment of players who play not for profit but for entertainment reasons, and these are the plankton that eventually feed the sharks at the top of the food chain. BTW, very interesting and sophisticated work on this post. It's definitely a concern, but I've always been impressed by how irrational people end up being, especially when it comes to poker. Another way around this outcome would be if these sites started growing their traffic enough from U.S. sharks to enable them to market more aggressively in Europe to bring in some international plankton. Thanks, I'm glad you enjoyed it, I'm a fan of your blog as well. If 20% that where winning players drop out as stated by Grange95 becouse they are not winners anymore. This does not have make a feedback loop that you talkabout becuse they would probobly still win with no rake. This means the top 80% will win more without them. Right, good point, it's only a feedback loop if the 20% that quit are worse than the average player in the player pool, in some sense. If roughly half of the player pool is legitimately bad players (rather than decent players who used to be winners), the guys on top would indeed do better when the worst winning players quit, because their average opponent gets easier. But if these sites have so many regular, serious players that the bottom 20% of formerly-winning players are also near the worst 20% of ALL players on the site (i.e. there are very few recreational players), then there would be feedback from them quitting. This definitely seems more likely on a post-Black Friday US site than it would have been in the past. The more I think about this, in the short term, some kind of equilibrium will shake out from the chaos. A certain number of recreational players (fish) will find riskier sites. A certain number of winning players will chase them. A certain number of players who used to be winning players but are losing players under the new system will either drop out or chase the fish; some of these will be winners and some will be losers in the new system. The interesting thing to see is where the new equilibrium sets itself. One guarantee is that some formerly marginally winning players simply won't have the same edge in the short-term new poker world order. They are the new fish, whether they realize it yet or not. That's a great point. I didn't consider that explicitly, but this model could still capture it. The finite average lifetime for the risky website could reflect both eventual closure by government as well as the inevitable bank run when "real" sites return. Something similar to a bank run occurs in either case, whether it's a voluntary bank run such as you describe, or a mandatory "all U.S. players must cash out immediately" in the cases I considered. The solvency of the site is key in each case. So you should be able to incorporate this additional risk by tweaking the per-day death probability parameter appropriately. I think an average lifetime of about 500 days is still a good guess... the possibility of government attack or voluntarily leaving the U.S. market is much likely to occur in the next 1-2 years than the return or emergence of a big, safe, U.S. site in such a short time period, unfortunately. Mike, if the consensus is that online poker will again be made widely available to US players, I think it would be worth considering what may happen when FT or PS come back online. Presumably, there would be few barriers to making deposits, new (bad) players will be attracted to the games, and veteran players would return for the security factors you outlined. Depending on the timing or abruptness of the new laws, the rush back to FT or PS could generate a mass exodus from less liquid sites. To the extent that this increases the risk of default or delayed withdraws, it obviously affects bankroll size preferences and reduces utility. Though I'm not sure a bank-run type event would be too plausible, I think it's an interesting topic since the return of more secure venues is certain eventually, as opposed to events like government-induced shutdowns. Thoughts?